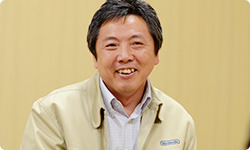 Sakaguchi-san, after it had been decided that we would make it as a Nintendo theme park, when did you hear about concrete design of the game world? I came in about the time that the prototype had come together somewhat. We started by thinking about what kind of package we could put the separate building blocks into. We came up with the official name of Nintendo Land quite a while later, but we had already decided on the idea of a Nintendo theme park by that time. However, we strongly felt that we really didn’t want each attraction to seem limited. Instead of simply assembling each game, I began to develop an image along the lines of sharpening each game’s personality so they would be more like theme park attractions. If it were a package for a sports resort game it would need to have cohesion, but with theme park attractions as the theme, the more different their atmospheres, the more each game’s personality would stand out. The theme park idea was an important one for bringing together what are at first glance disparate elements. We were also making the visuals for every game separately. That’s right! (laughs) We designed each game to show off its characteristics – adopting a 2D-like screen, taking an overhead view or dividing up the screen, and so on. Another characteristic of Nintendo Land is that before you take on each attraction, there’s a scene featuring Mii characters dressing up into different costumes. They suit up in a way appropriate to each attraction, like Mario or Link . Yes. The dress up scene emphasises that you play dressed as a certain character, so as designers, we were able to play up each game’s characteristics as much as we wanted. Through the dress up scene, the players will naturally accept that if the attractions are different, then of course they all look different. in Takamaru’s Ninja Castle , you’re on this side of the camera, so the Mii character never appears. Design-wise, I wondered, “What in the world is this? !” (laughs) But triangles were the most fun for playing, so we simply kept the same design from the prototype. We settled matters one after the other, and thought, “This is what this game is like,” and tried to achieve bold designs. But if a Mii character dresses up as Mario, transforming into an imitation Mario, the difficulty arises of how far you can tamper with the original. Yes. But we had a fun time deciding how to handle that. Animal Crossing: Sweet Day by which when you eat sweets, your head gets bigger and you slow down? At first, a programmer made the heads bigger to make their figures clear, but it looked funny and was an easy rule to understand, so we kept it like that. Eh? You just used a specification adopted by the programmer to make their figures clear in the prototype? In the same way that Miyamoto-san asks, “What powers Propeller Mario’s movement?”10, you explain it by saying, “Their heads get bigger because they’re full of sweets.”10. What powers Propeller Mario’s movement? : For more discussion about what powers Propeller Mario, go to Iwata Asks: New Super Mario Bros. Wii: Volume 1. We created a world that is somewhat released from the original constraints, but everyone was very magnanimous. I’m extremely grateful that they let us do whatever we wanted as long as it was fun. We have taken some extreme liberties, though. Pikmin Adventure to make use of the important part of gameplay was to place a round ball on enemies’ backs so you can clearly tell where their weak spot is. Usually, it would be covered with hair or be more difficult to tell somehow, but this way was much easier to understand. It’s the result of pursuing design according to function. Yes. In Pikmin Adventure, you can become a Pikmin, and since Pikmin are edible, I wanted to feature that and imagined what happened after they were eaten. If you don’t say how that turns out, no one will understand. Well… Pikmin that get eaten are then excreted. Sorry. We knew they would never do that in the original, so we worked hard to put it in. In The Legend of Zelda: Skyward Sword11, bird poop will fall on you. That realism was a relief. Sorry to be talking about such things.11. The Legend of Zelda: Skyward Sword: An action-adventure game released for the Wii console in November 2011. Yes. That was the easiest to understand, and I was relieved when (Yoshio) Sakamoto-san12said, “That’s fine.” (laughs)12. 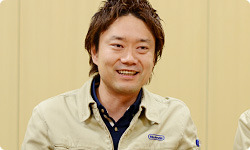 Yoshio Sakamoto: General Manager, Software Planning & Development Department, Software Planning & Development Division. 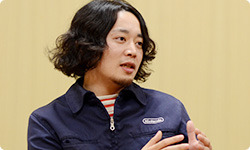 He has produced such games as the WarioWare, Inc. series, Rhythm Paradise, and Metroid: Other M. He has appeared in sessions of "Iwata Asks" about WarioWare: Smooth Moves and Metroid: Other M (Volume 1: The Collaboration), as well as a session with Final Fantasy creator Hironobu Sakaguchi. You really do pursue design by function. By the way, how did the character with a billboard as its head that characterises Nintendo Land come about? A hint to that character was how we were able to work with two audio output sources. We’ve never had anything structured like this before, with two speakers – on the television and Wii U GamePad in your hands – so I definitely wanted to take advantage of it. They might say, “This way!” from the Wii U GamePad and direct your gaze to the television screen. the characters help you navigate by speaking, making use of that audio feature . If one was the shape of a monitor, we could display a lot and if it had three fingers, it could count to three, so that’s how Monita came about.